hydrofoil kiteboard / recreational / all-around / entry-level - Alien Air 4'8"
2017 Alien Air: The Alien Air returns to Slingshots lineup as a proven board for all-around performance and user-friendly foiling progression. 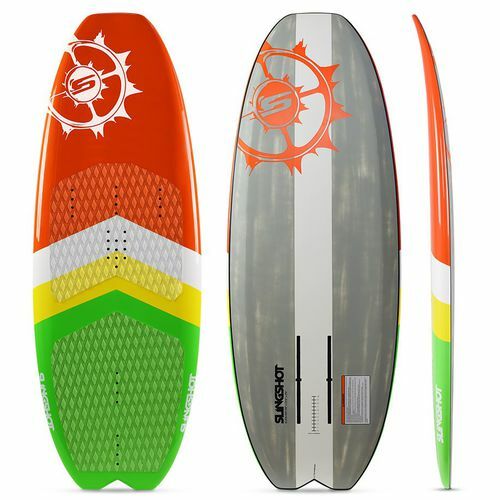 Featuring robust a concave deck, scooped nose, wide body and movable track mounting system, the Alien Air is a board that will get you up, foiling and having a blast. A wide body provides stability and a large surface area to move about as you please, while an aggressively scooped nose makes a dramatic difference in recovering rather than crashing when you nose-dive. As with all boards in our foil lineup, the Alien Air features bomber Slingshot construction and was designed by legendary shaper Tony Logosz.